Note the typo they had in the subject line! New phishing scam with ties to IP ranges in other countries. The links in the emails go to sites in IP ranges different from the IP ranges and in different countries sending the emails. This appears to be a larger operation than normal – I have blocked 4 completely different ranges today! If you get an email like this DO NOT Click on it! Of course it is nearly impossible to “Learn Spam” in a Bayesian system with email like this because the actual Text content is NOT something you would really want to eliminate. 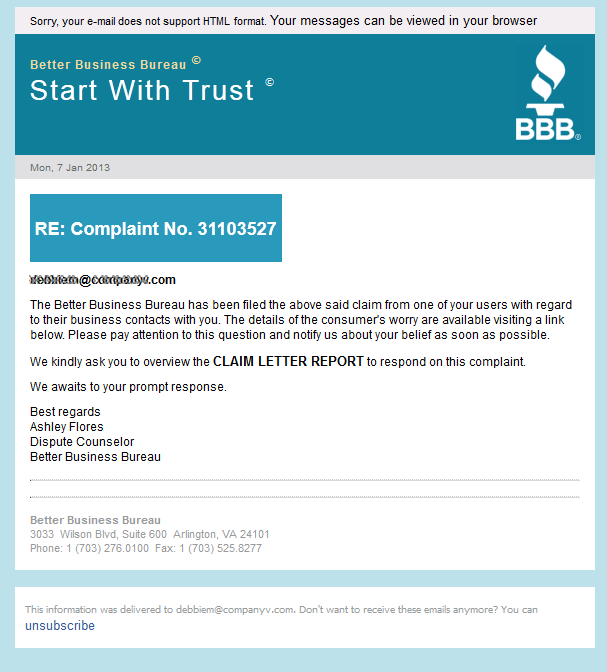 The Better Business Bureau has been filed the above said claim from one of your users with regard to their business contacts with you. The details of the consumer’s worry are available visiting a link below. Please pay attention to this question and notify us about your belief as soon as possible. We kindly ask you to overview the CLAIM LETTER REPORT to respond on this complaint. We awaits to your prompt response.